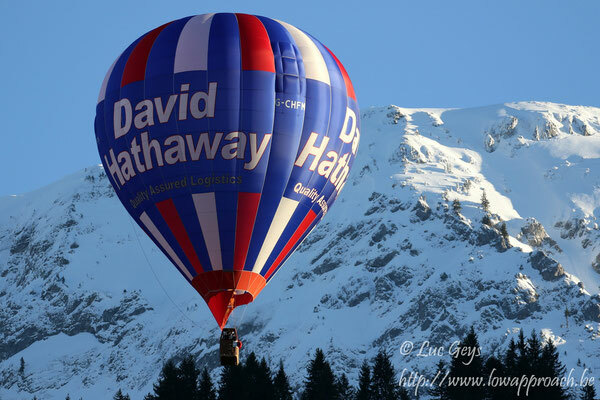 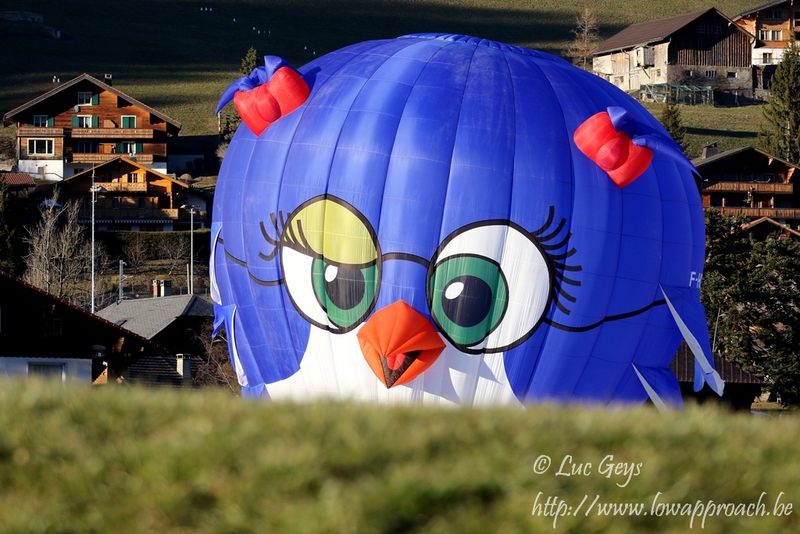 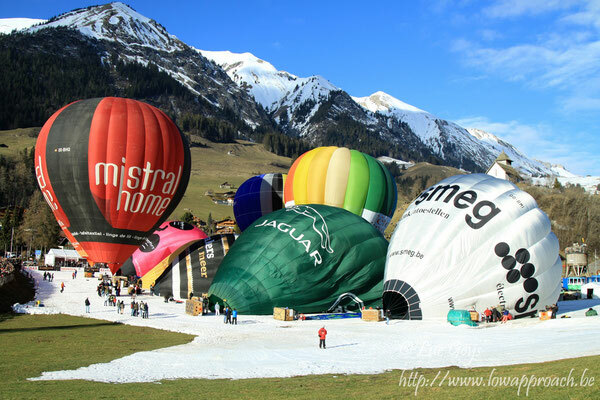 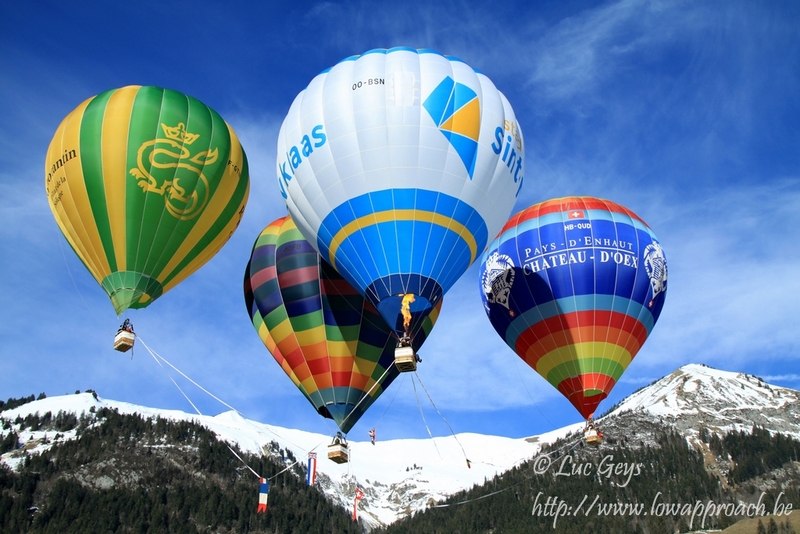 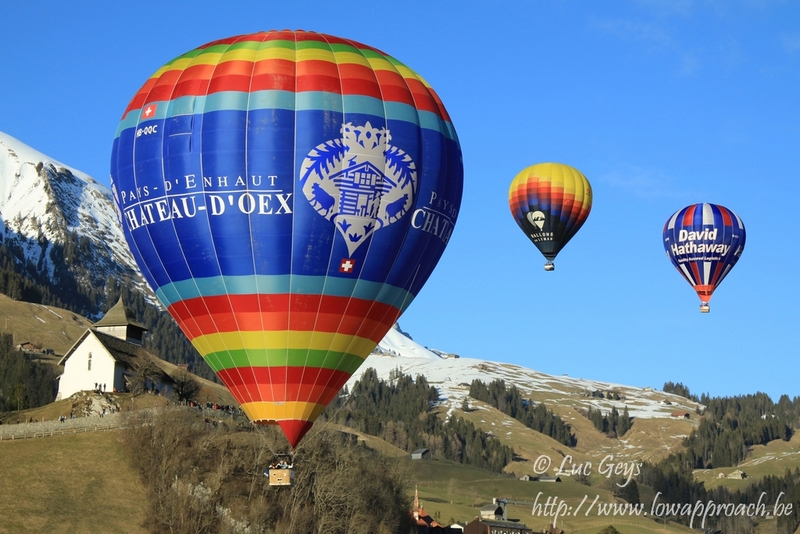 The International Hot-air Balloon Festival at Château-d’Oex has, over the course of the last 40 years, become a top event for the whole region and even well beyond. 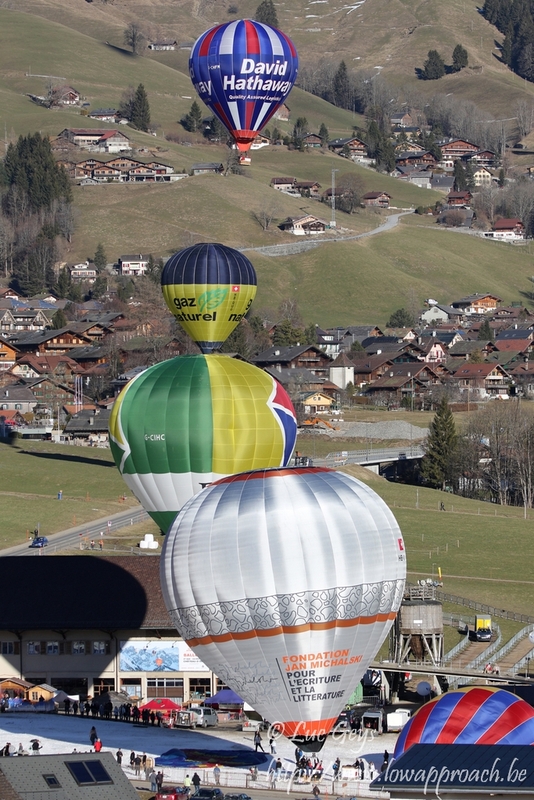 In 1979 the Tourist Office, partnered by Hans Büker, arranged the first International Hot-air Balloon Week, with 12 balloons from 5 countries taking part. The innovative event introduced people in Switzerland and abroad to Château-d’Oex. 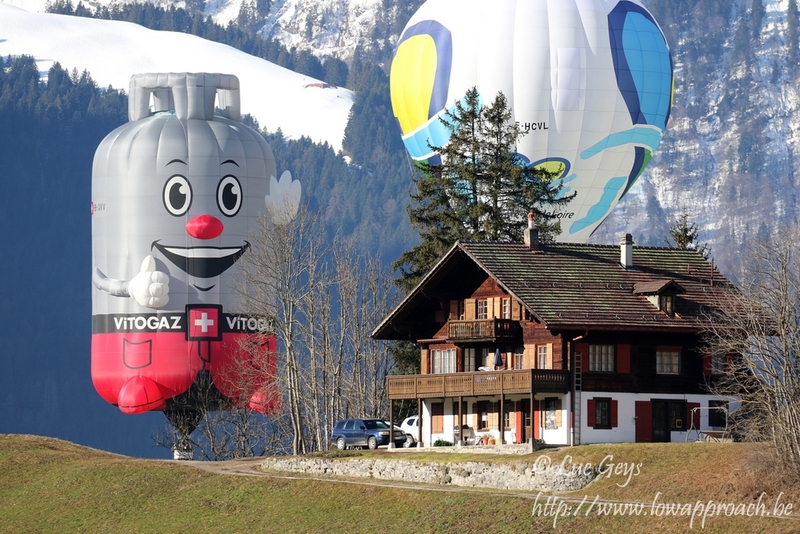 In 1981 the Special Shape balloon appeared on the scene in the form of the largest balloon ever seen: a 60-meter-tall Father Christmas. 1989 was a year full of records: 9 days of sun, 70 balloons from 14 countries, 150 journalists, 8 TV stations and more than 25000 spectators. In 1991 the first Night Glow was organized. 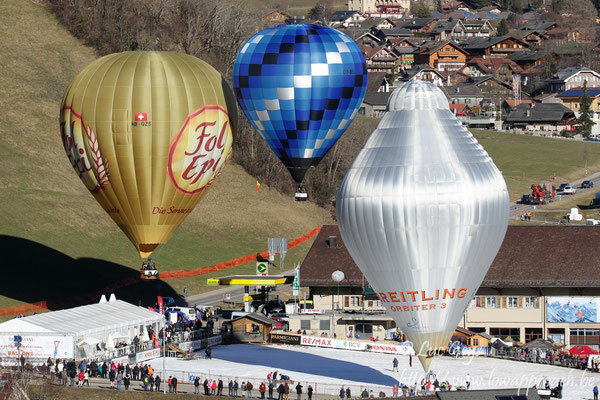 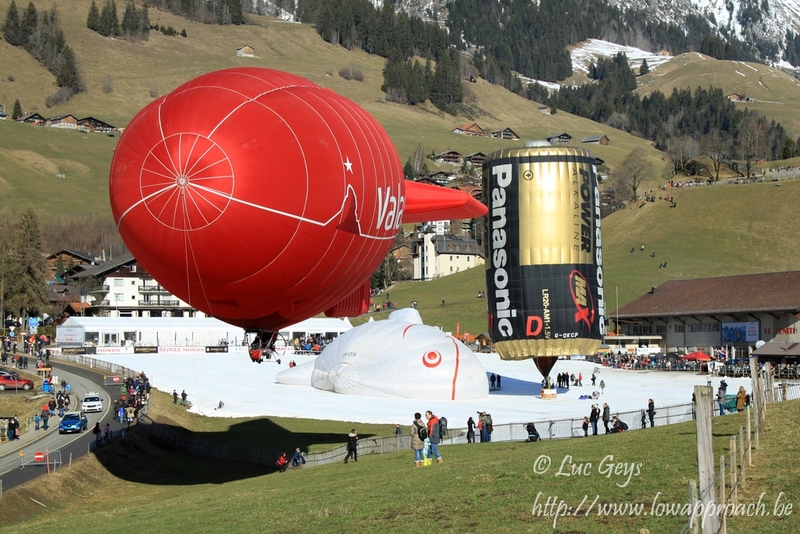 In 1994 the event was organized together with the 4th World Hot-air Airship Championships. 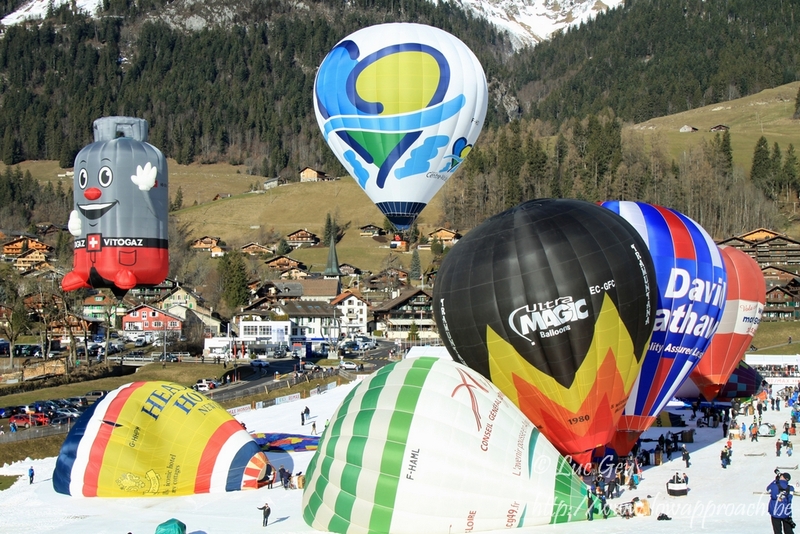 The first such event to be held in Switzerland, in the mountains, in winter. Parmigiani High Precision Target. 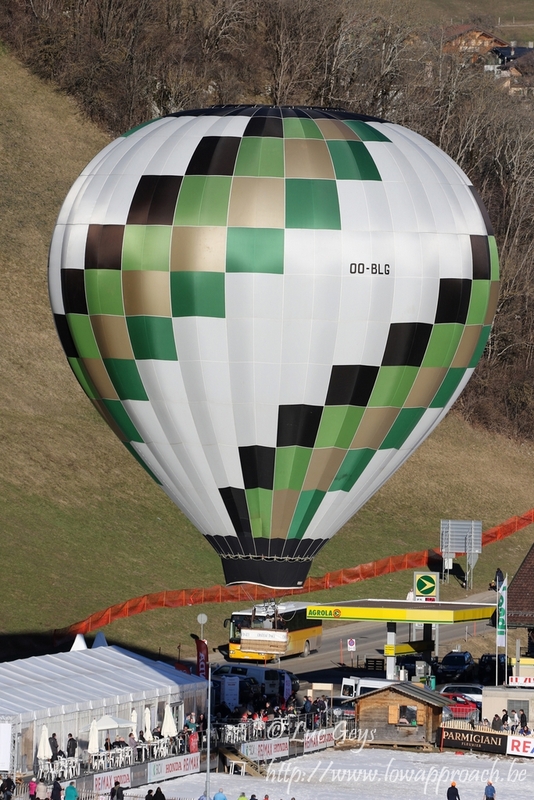 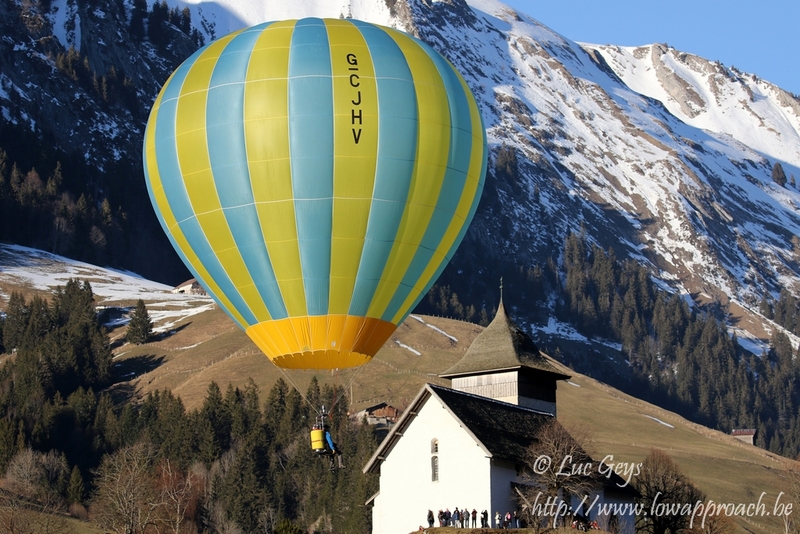 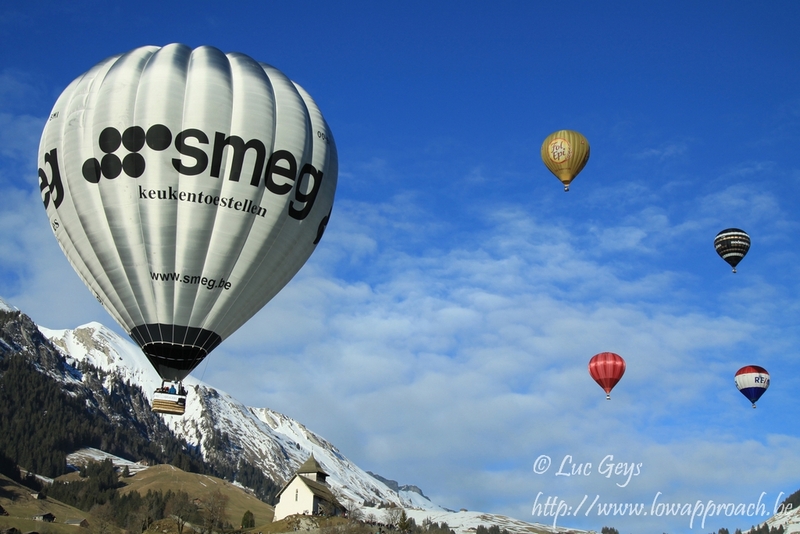 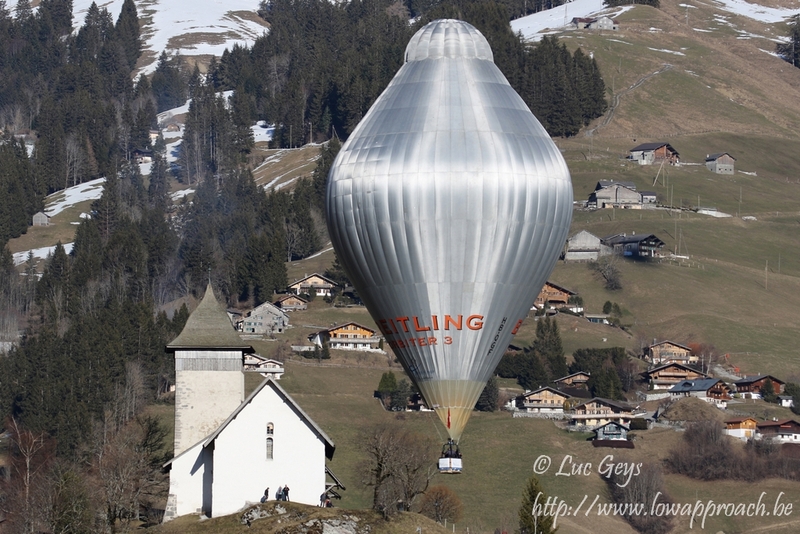 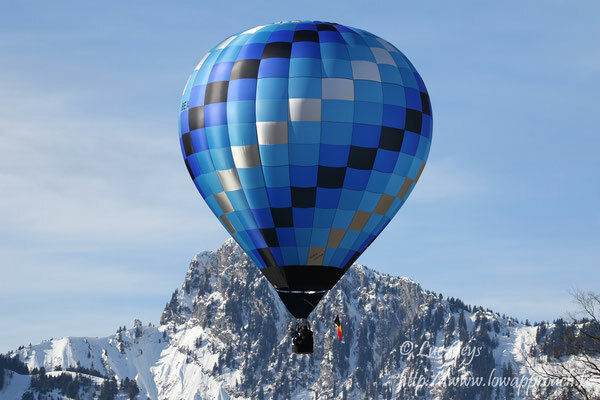 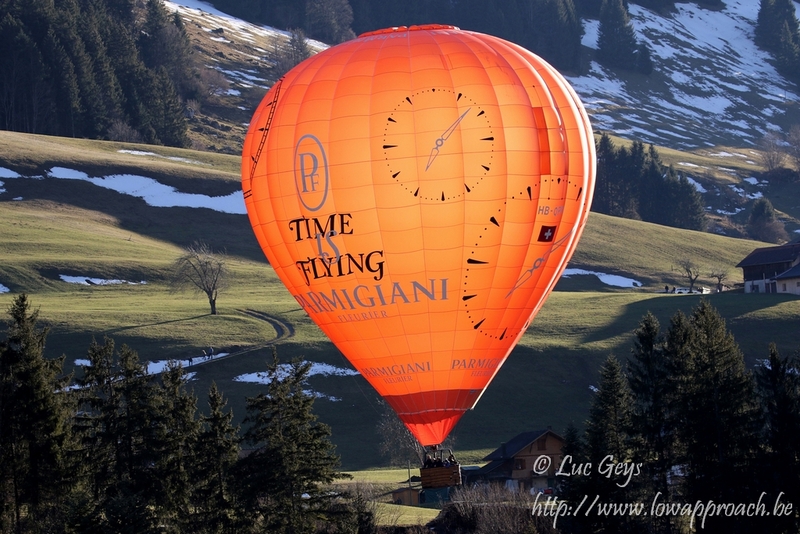 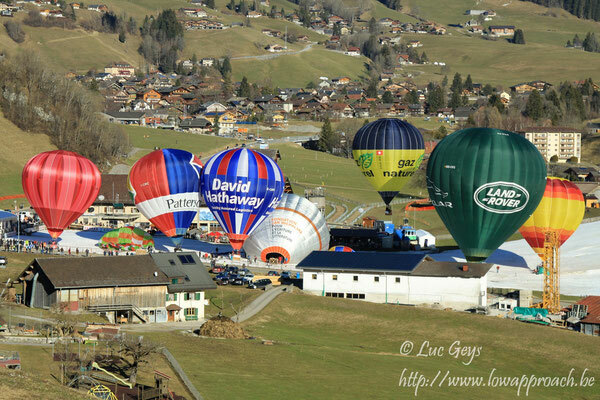 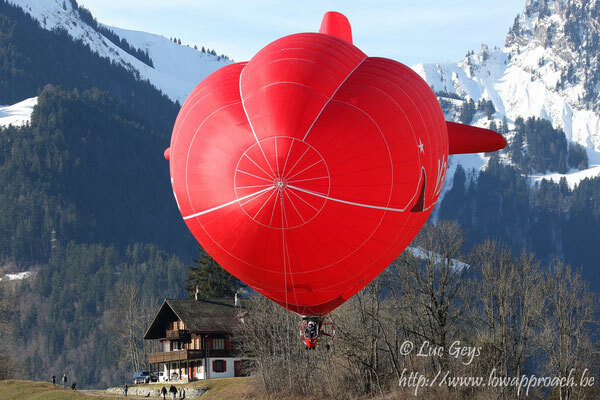 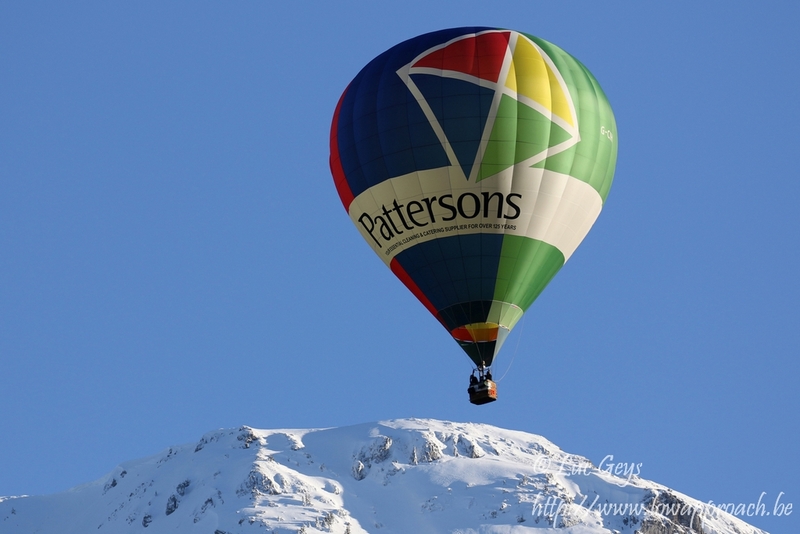 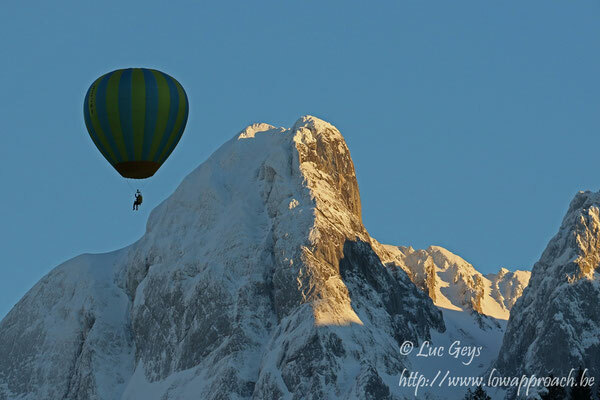 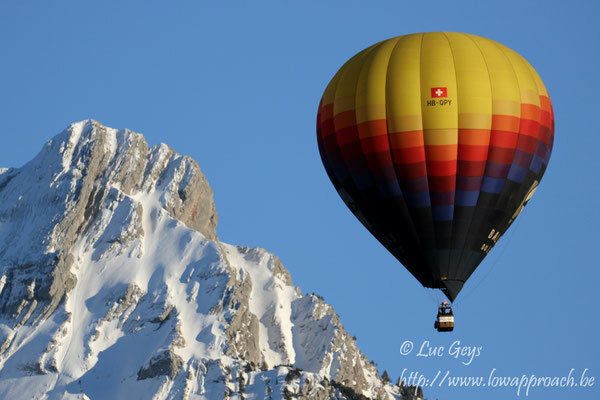 In one of the competitions balloons take off from Rougemont, upwind, and descend into the valley with the air currents. A target is set out in the what is normally the launch area at Château-d’Oex. 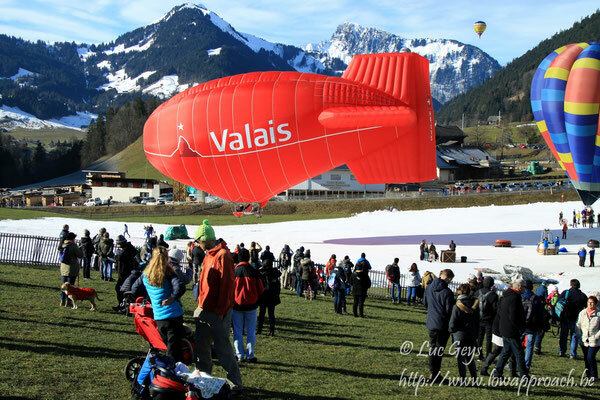 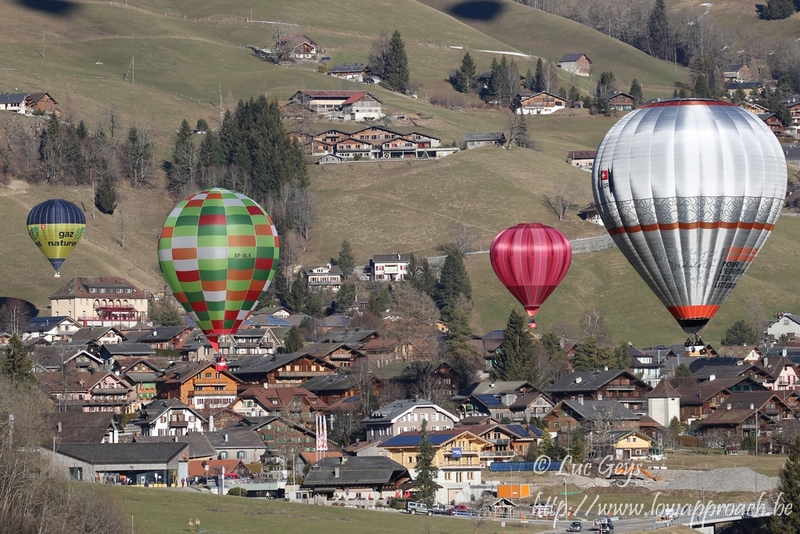 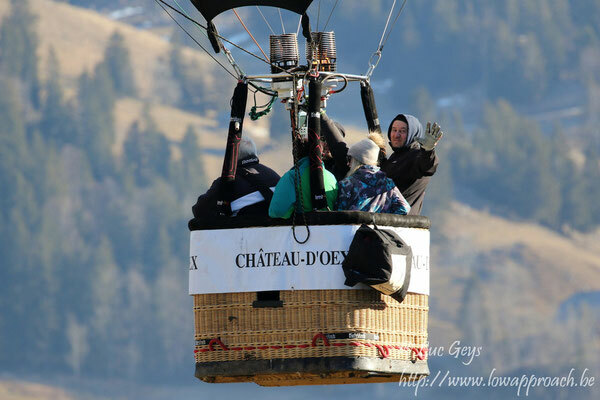 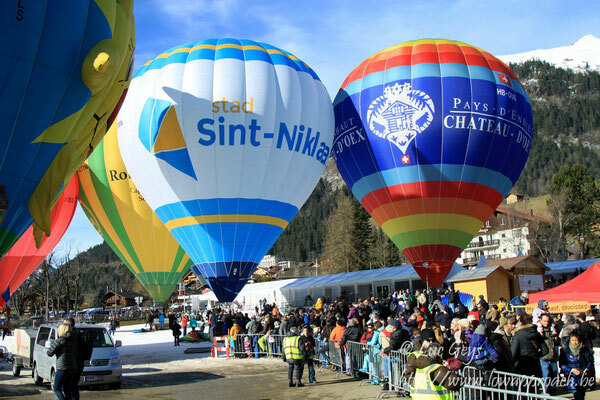 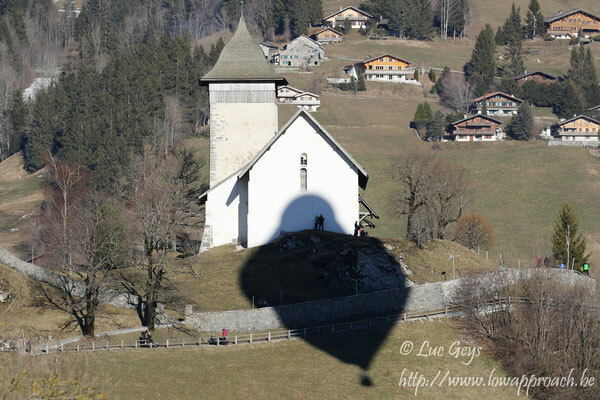 Pilots can choose their own route and landscapes, while the spectators are offered a different show, that of the arrival of the balloons at Château-d’Oex. This years’ event was held from January 27 to February 4. 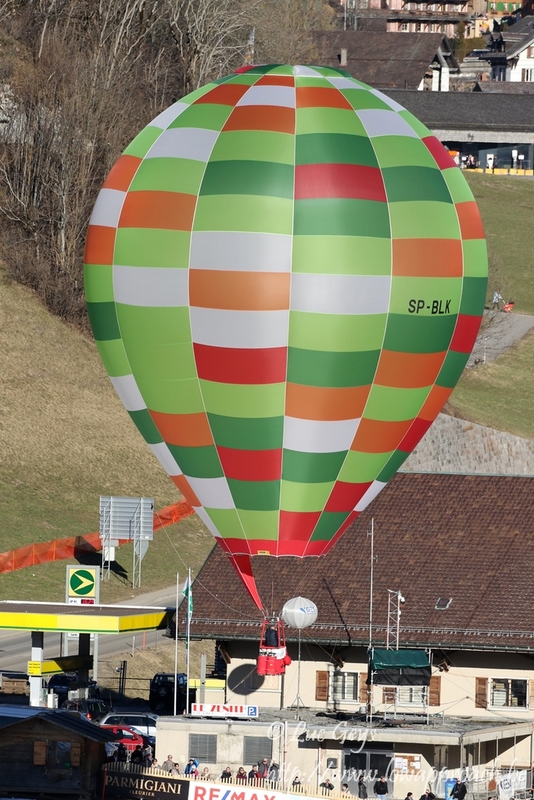 The weather was fine on the first 4 days. 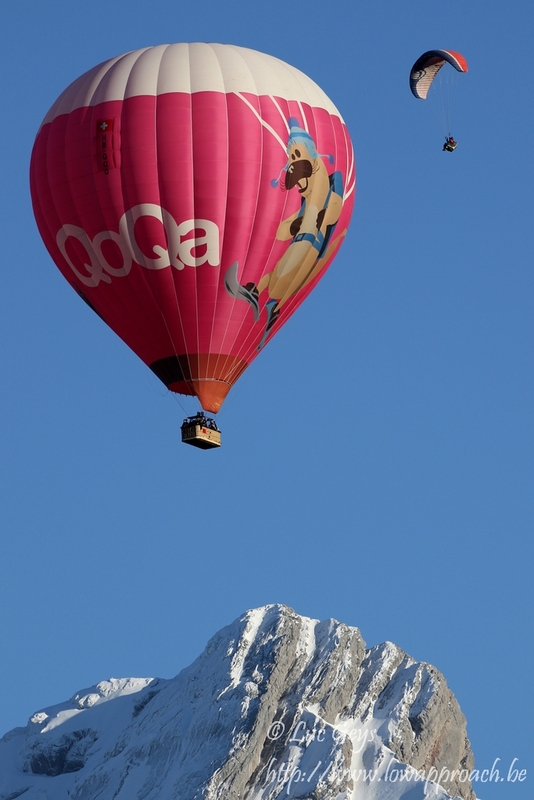 Temperatures were going up to 10°C. 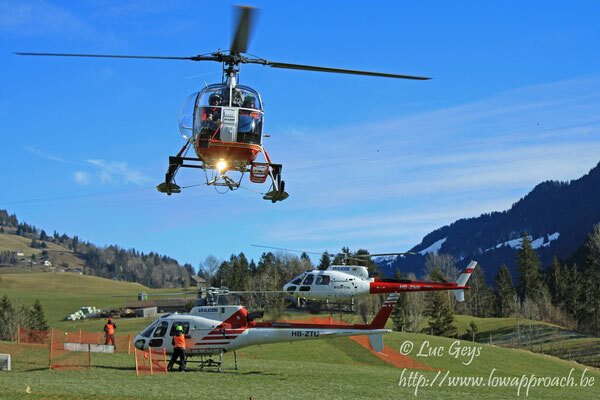 Then they were 2 days of bad weather and even some snow. The last Friday and weekend were fine again so the balloons could fly again. 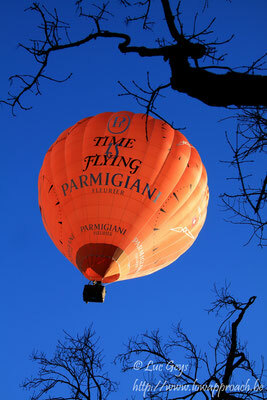 The Night Glow on Friday evening was real success. We visited the event on the first Sunday and Monday so we were lucky so see some activity. 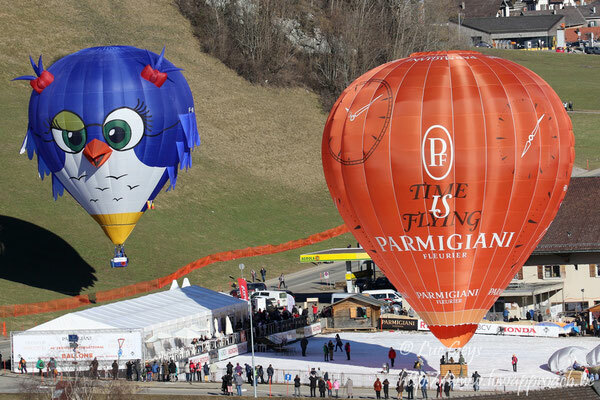 During the weekend there are extra shows of paragliders and aerobatic aircraft. 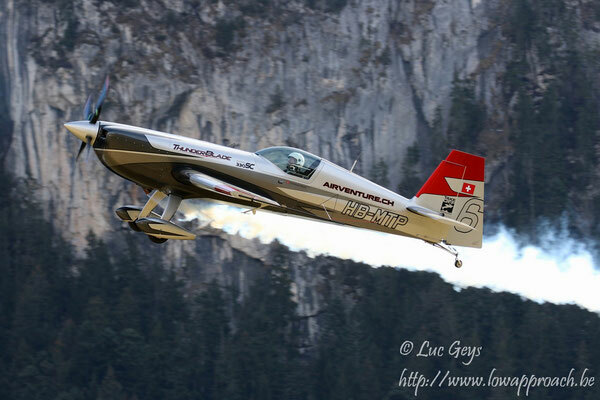 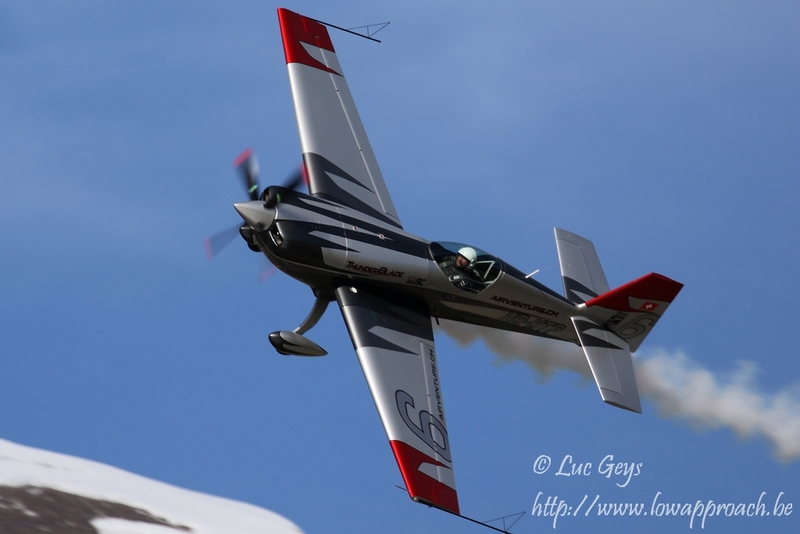 Christophe Meyer gave a very spirited display in his Extra EA300SC HB-MTP. 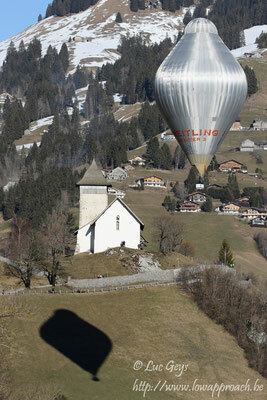 He concluded his act with a nice low pass through the valley. 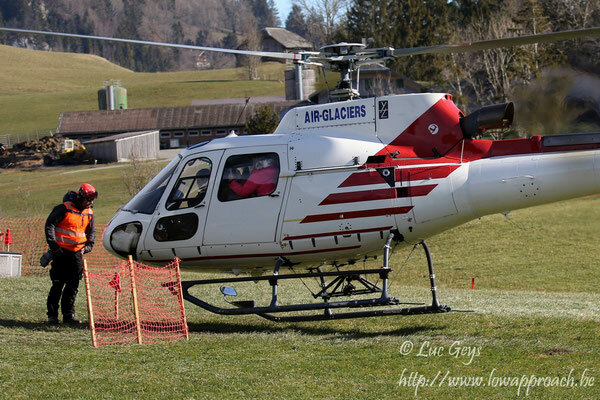 Helicopters of Air Glaciers were giving joy flights in the valley, where are very popular with the Swiss crowd. 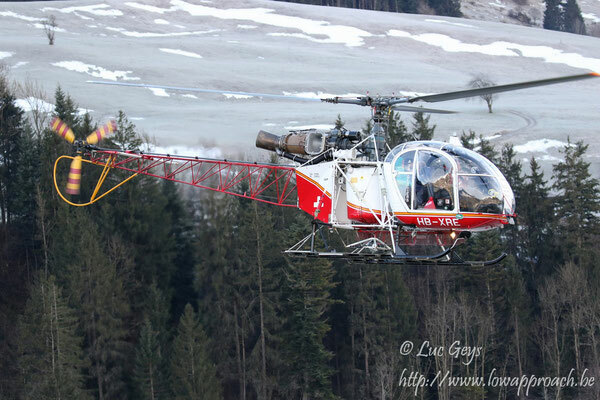 During the first weekend 4 helicopters were used, one of them was a SA.315B Lama, the civil version of an Allouette II.